In this article, journalist Adrienne Day explores Green Schoolyards America’s work to connect ecological innovation with education, equity, and community engagement. "How turning gray schoolyards green could help cities cool off"
Despite a number of well-known parks and leafy boulevards, Paris, France has significantly less green space than many of its European neighbors. As part of a plan to improve climate resilience, one organization there has launched a campaign to turn all 800 schools in Paris into "islands of cool." This article by journalist Matt Hickman describes the project, including how the schools are addressing security and cost concerns, and compares these efforts to the ones Green Schoolyards America is leading in the United States -- especially our partnership with the Trust for Public Land and related pilot projects at schools in Oakland Unified School District. "WHYY Community Conversation: The Push for Playgrounds Brings People Together"
This article, by journalist Taylor Allen, reports on a community event in Philadelphia that explored the City’s need for more playgrounds. Green Schoolyards America’s Sharon Danks joined WHYY, the Philadelphia School District, Plan Philly, and community members in a conversation about how to use school grounds to provide more play opportunities and access to nature for all children. "Uneven Play: Most Philadelphia Public Schools Don’t Have Playgrounds. That’s Slowly Changing." Journalist Nina Feldman examines inequalities in Philadelphia public school playgrounds, and discusses possibilities for improving children's access to high quality play environments. Sharon Danks is cited in this article and the written piece is accompanied by a radio segment that is available online. "San Francisco Shares Its Schoolyards, Opening Communities to Green Spaces and One Another’s Lives." Journalist Nina Feldman explores San Francisco's pioneering program to share urban schoolyards with the community, and explains how the city navigates the complexities of public access, liability, and program management. This article is accompanied by a radio segment that is available online. "Why Green Classrooms could be the Schools of the Future"
In this article, journalist Adrienne Day explores the possibilities that green schoolyards afford to children and the environment, and includes insights from our CEO Sharon Danks, researcher William Sullivan, and our colleagues from Golestan Education and Hoover Elementary. "A Vision for Green Schoolyards Across California"
Green Technology Magazine’s Carl Smith interviews our CEO, Sharon Danks, about the need for living schoolyards and our vision for using school grounds to improve the well-being of children, their communities, and the environment across the state, and beyond. Despite a number of well-known parks and leafy boulevards, Paris, France has significantly less green space than many of its European neighbors. As part of a plan to improve climate resilience, one organization there has launched a campaign to turn all 800 schools in Paris into "islands of cool." This article describes the project and compares these efforts to the ones Green Schoolyards America is leading in the United States. "5 Organizations That Are Transforming Eco Curricula"
Our schoolyard Activity Guides are featured by the Sierra Club as one of their top free resources for bringing nature into the classroom! Jared Blumenfeld, the U.S. EPA’s Region 9 Administrator under President Obama, interviews our CEO, Sharon Danks, along with Richard Louv, Wanda Stewart, and others (including children!) in a fantastic podcast about the importance of greening school grounds. These interviews highlight the health-related aspects of the green schoolyard movement. Social entrepreneur Antonella Broglia highlights two innovators who redesign schools to achieve a richer education for children. This video focuses on the work of Kabir Vajpeyi in India and Sharon Danks in the USA. "Transforming Schoolyards, Our Most Abundant Public Spaces"
Interviews with Sharon Danks about her plan to turn asphalt schoolyards into vibrant green spaces the improve the well-being of children, their communities, and the environment across America. "14 People Inspiring a Brighter Future"
Ashoka announces its newest class of Ashoka Fellows in 2017, including Sharon Danks, Green Schoolyards America's CEO. Scroll to the bottom for a profile about Sharon. "School Grounds: Special Places for the Child and Nature in our Cities"
This feature article, written by Sharon Danks and Cam Collyer, explores the history of green schoolyards in the USA and Canada. Both of the authors have works in this field for ~20 years, and they provide their insights about where the movement has been, and where it is headed next. The piece also includes examples of specific schools and programs in both countries. "Some Schools Trading the Blacktop for Greentop as an Innovative way to Teach Science"
This article on green school grounds in California highlights Sequoia Elementary in Oakland and Golestan Education in Berkeley. It provides information on where schools can find funding and how they tackle the typical hurdles of school ground greening. Sharon Danks adds Green Schoolyards America’s perspective. "Curriculum Review: 2016 Living Schoolyard Activity Guides"
In this article, author Herb Broda reviews our 2016 Living Schoolyard Activity Guides. Activities in this edition were organized by region, to help practitioners find ideas that best fit their climate and ecology. "How Small Steps Can Create Outdoors Experiences In Schools"
This article profiles a school near St. Louis, Missouri that has increased their use of the outdoors as a learning space and place for healthy development, with limited funding. The school saw an increase in academic engagement and kindness in the ways that students interacted with each other. Sharon Danks adds Green Schoolyards America’s perspective to the conversation. "The Nature-Rich School: How Parents and Teachers Can Support One Another as Natural Teachers"
Best-selling author, Richard Louv, lists 500 ways to enrich the health and happiness of your community and combat nature-deficit disorder. In Part 7, The School of Nature, our CEO, Sharon Danks, suggests ways to do this through the design and use of school grounds on page 196. "From Green Schools to Green Communities"
Kenny Ballentine, founder of The Nature Kids Institute, interviews Green Schoolyards America's CEO, Sharon Danks, for Episode 10 of his podcast, Nature Kids Radio. The conversation focuses on the value of risk for child development. "Making Mountain View Schools a Little Greener"
"Hitched to Everything: Place-Based Learning"
Scientist, educator, and TV personality, Scott Sampson, discusses how a connection to place can help children understand the foundations of ecology better than a traditional science education. Green Schoolyards America and Sharon Danks are included on pages 113-114. "Skolgården en del av stadens ekosystem"
Anna Lenninger writes about Green Schoolyards America’s city-wide approach to planning school grounds as important components of urban ecological infrastructure. This article is in Swedish, and appears on pages 46-49 of this printed publication. "Green Schoolyards America – a Green Thumbprint for Kids in Berkeley"
Spotlight on Green Schoolyards America as one of the many progressive, environmentally-conscious organizations in Berkeley. "Call of the Wild: Do Overprotected Kids Need to “Get Risky” on Playgrounds Like This?" Article about the benefits of risk for children, especially in playgrounds. Highlights Berkeley's Adventure Playground and the history of the adventure playground movement. "A Look at Five Schools That are Taking Learning Back to Nature"
Profiles schools in Sweden, Japan, Berlin, British Columbia, and Pakistan as part of an article on the international green school grounds movement. Green Schoolyards America’s CEO, Sharon Danks, is also the co-founder of the International School Grounds Alliance. She described the birth of this collaborative international organization in this article. "Asphalt to Ecosystems – Design Ideas for Schoolyard Transformation"
Radio episode about Sharon Danks's book on green schoolyard design. Focus on broadening our notion of what school grounds should be. Ideas and examples on how to create school gardens from teachers and experts around the country. "Voices From the International School Grounds Movement"
Perspectives from seven international leaders in the school ground field, as presented at the International Green Schoolyards Conference held in California in September 2011. 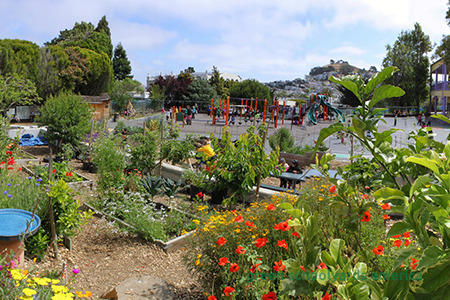 "The Next Crop: Landscape Architects Help Direct Efforts to Make Edible, Sustainable (and Fun) Schoolyards in San Francisco"
This article examines the growing green schoolyard movement in San Francisco, and the design firms that are helping to change children’s landscapes in the city. Sharon Danks shares her perspective as someone who helped to establish and design the district’s program. "How to Build a Better Playground"
OnEarth’s Shanti Menon interviews Sharon Danks about her vision for transforming school grounds into green schoolyards. This article also includes a short video that profiles Sharon’s ideas in the context of the green schoolyard at Rosa Parks Elementary School in Berkeley. "A Planner Who Favors Edible, Eco Education — and Risks"
Berkeleyside’s Sarah Henry interviews Sharon Danks about her book, Asphalt to Ecosystems, the global green schoolyard movement, and the value of risk in children’s play environments. "Asphalt to Ecosystems: An Interview with Sharon Danks"
Highlights favorite sections of the book. Includes a bulleted list of top pieces of advice for schools wanting to green their grounds. "Green Playgrounds Spring Up Around Bay Area"
Highlights our CEO Sharon Danks's work designing green schoolyards for San Francisco Unified School District with her firm Bay Tree Design. "Nature's Classroom: Eco-friendly schoolyards a space for teaching everything from poetry to nutrition"
Our CEO, Sharon Danks, returns to childhood home of Highland Park for book signing and to speak about enhancing learning and play through environmentally-friendly playgrounds and learning spaces.